David Rose, with partner Kathy, has carved out a fine career as an independent film and television producer. 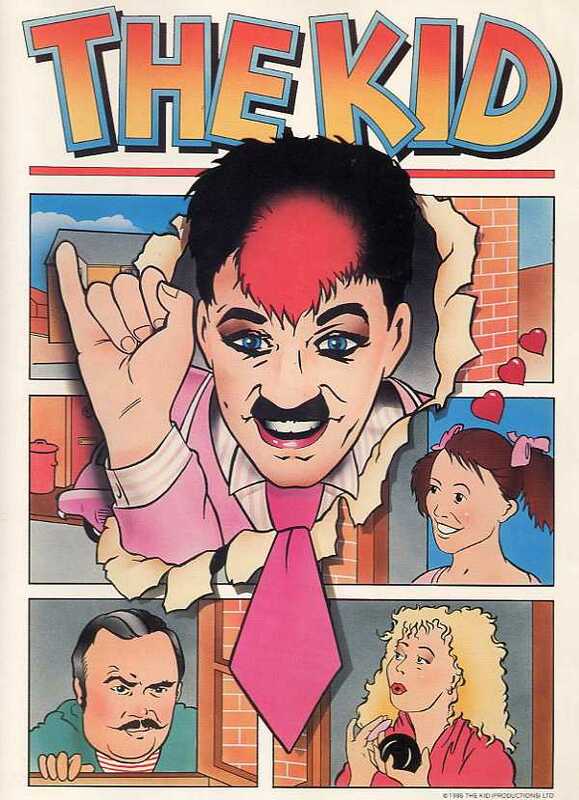 Initially making waves producing pop videos in the early eighties, The Kid, which starred Fairnie, marked the Roses’ transition into the world of children’s TV. They went on to create “The Tics”, billed as the first cartoon on radio, which aired on BBC Radio 5. More recent notable achievement have included writing the story for the 2005 movie “Mrs Henderson Presents”, which starred Judi Dench and Bob Hoskins. Step forward please, David (pictured above standing behind Fairnie, alongside Mike Slee and Kathy Rose). The first time we met Steve he was a cardboard cut-out! Famous Names were doing a gig at The Venue (in Victoria, London – sadly now closed). Richard Branson (who ran the joint in those days) was stumbling around in full frog-man’s outfit and in the centre of the dance floor was a huge boxing ring. It was all a bit closer to a circus than a music gig. Sadly, Steve had just had an operation, thus his place was taken on stage by a life-size cardboard cut-out! Late seventies / early eighties we were generally “out and about” at clubs like Blitz, Embassy, Club for Heroes, etc., hanging with Spandau Ballet, Kid Creole, Grace Jones, Gary Numan and the lesser-known (but none-the-less just as talented) Peter Godwin, Shock, Landscape, Visage and a Scottish chap called Midge Ure and his band… Somewhere in that swirl we found Steve and Bev, bonded, and became very good friends. We had just started out making pop videos and we offered to make one for Falling in Love Again. Did that video get made? Yes, in our cramped little flat over a launderette. There are two versions of the video: when we started it was going to be released under the name “Bev and the Brides” but then became a Techno Twins release, so the first version has glimpses of what the Bev and the Brides version would have looked like. What other Techno songs do you think would have inspired you to make a great accompanying video? Isn’t it a shame that such a highly visual outfit never really fully exploited the video medium. Why do you think that was? Well, you have to remember that film was prohibitively expensive and home video didn’t exist. If Steve were still around I would suspect he would revel in the glories of video which is now available so cheaply. I also think he would have had a great time with the internet and all the possibilities that has opened up. But, sadly, he saw neither. How did The Kid initially come about? It was a strange combination that brought The Kid together. Steve was well-known for his Chaplin exploits and had made a pilot show called “Right Charlie” for YTV – Chaplin plonked into the middle of the eighties. Although Steve was great, the film didn’t work that well, although why is hard to pin down. My colleague at the time, Mike Slee (who we’d met at college, the London College of Printing, Film School), was a huge Chaplin fan and did a mean Chaplin impression himself. I loved silent movies and we were starting to make kids’ TV programmes… so between us we concocted The Kid, the costume and the idea of a bizarre character in the modern world. Can you break down the roles that each of you had? Who added what is difficult to disentangle. I wanted not Chaplin but Chaplin’s son or grandson (Charlie’s Kid), a modern version using modern filming techniques: a kind of live-action cartoon with the action in strip cartoon frames. But really, the ideas evolved over many bottles of wine, scribble pads and laughter. How did you go about writing the various scenarios? The scenarios were essentially one-line ideas, starting with “What if…”: What if The Kid went on a picnic? What if The Kid went to a restaurant… The films were mostly made up on the day and very little was planned; we would meet at a location at eight o’clock and see where the day took us. It was just a huge (and expensive) experiment. We decided to have a regular cast of characters – The Fat Man, The Blonde and The Little Girl – and mix them up. It was bizarre and wonderful and no-one really understood what they were all about, but that was a part of it – neither did we most of the time! We then gave the silent, edited films to Georg Kajanus and Henry Marsh and they added another level of magic with the soundtrack and effects – and, again, remember this was all before we had computers! So, in retrospect, the effects, the voices and the music are even more astounding today. How well-received was The Kid? But we all feel it was a huge success, even if it didn’t make any money. What other projects did you work on together? What did you move on to after The Kid? 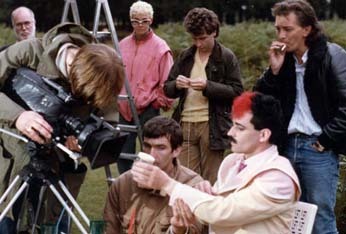 Of course, Fairnie himself also tried his hand at making videos, for the Greenbelt ’86 film and pop videos for Fat and Frantic. Do you think this is a direction he could have pursued further? Finally, what are your fondest memories of Fairnie, whether at work or in the real world? Fondest memories are the sketch nights where a group of us would take over a restaurant and perform sketches, mostly directed by Steve, the best of which was when Steve took over the waiter’s door to the kitchen, which had a small window in the middle, and perfomed the memorable “Lift Sketch”. But it is all really indescribable, it was a case of “you had to be there”.